Children learn to say sounds correctly by listening and hearing the people around them speak. Speech sounds, sometimes called phonemes, are acquired and mastered at all different ages. For instance, the /p/ phoneme develops early for children, and we often hear it as they babble; whereas, the /s/ phoneme develops much later. It’s perfectly normal at the age of 3 for a child to say “tat” instead of “sat.” As a child grows, they will learn to say and use their speech sounds correctly. For some children, articulating speech sounds correctly is a challenge. A child may have difficulty producing a few sounds or they may have trouble producing many. These children are considered to have a speech sound or articulation disorder. 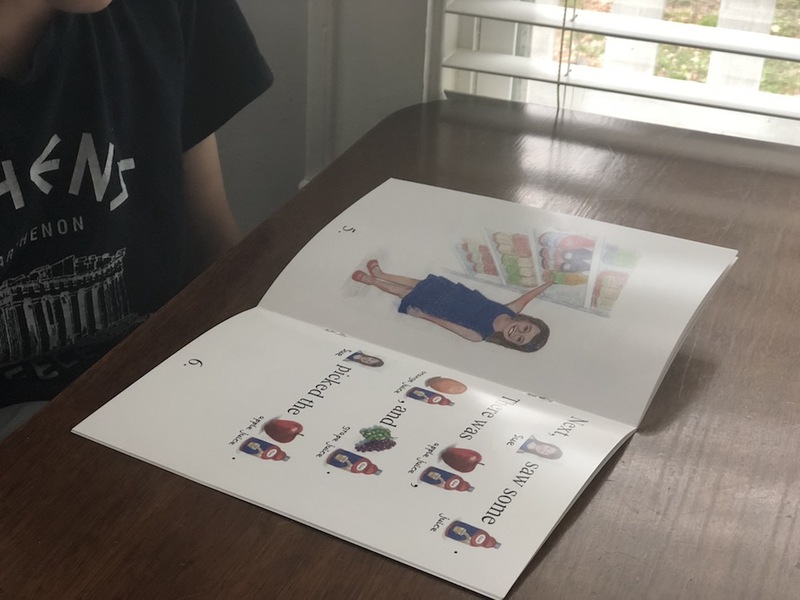 When I work individually with a child on their articulation or speech sound production skills, my ultimate goal in their session is to provide them with a minimum of 100 trials, meaning at least 100 opportunities to correctly say their target speech sounds. Repetitions of correct sound/phoneme productions are crucial to your child’s success. That is why, we as SLPs, give you word lists for your child to practice as homework each week after your session. As a speech therapist or parent, know that you are not alone in facing resistance from your client or child. I know I am not the only one who has had a child say something like, “Are we done yet?” or “How many more words do I have to say?” Aiming to achieve the 100+ trials during a session is challenging, but the benefits are worth the work both you and the child are putting in. During our work on speech sounds, SLPs and parents have to gauge a child’s motivation, attention, and willingness to participate in our repetitive tasks. I use Playing with Purpose (PWP) to keep myself engaged and therefore the child I am working with interested. When I play with a purpose, I integrate fun games or activities into articulation therapy sessions to stay productive and achieve the goal of 100+ trials. 1. Play Jenga. 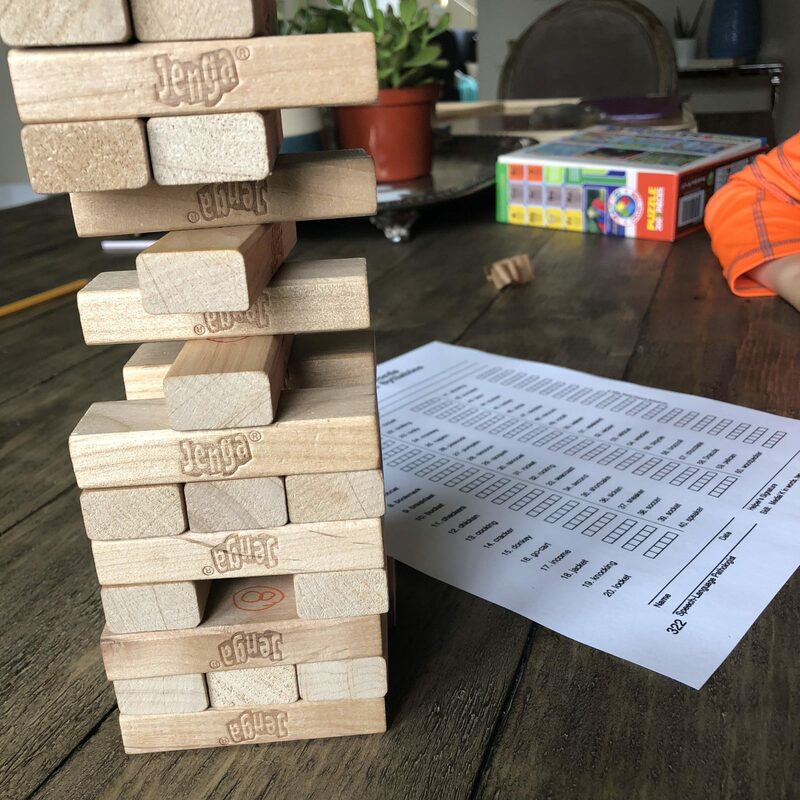 I got this first idea from a teacher friend who used Jenga as a tool for her students practicing their spelling words. Take your classic plain, wooden Jenga game and write numbers on each of the blocks in permanent marker. The lowest number I have written on mine is 5, and I go up to 12, leaving some blocks blank for a free turn. Then you play the game as you typically would. Each time it’s the child’s turn, they say as many words with their target sounds as the number on their block indicates. You can also use this activity with words, phrases, or formulated sentences that contain the target speech sounds. 2. Use Uno and other card or board games. The Uno card game is a favorite of the children I work with. Play the game as the rules intended, but whatever card the child lays down, that is how many times they have to practice their speech sounds. Get creative with the rules you have for the special cards like the Draw 4. I like to have kids practice 20 words with this card, particularly if they have had a series of lower numbered cards. This tip holds up with most other board games where a child has to move a specified number of spaces per turn. Chutes and Ladders is a good one for the younger children. In addition to speech sound practice, you can also address turn taking or other pragmatic language elements. 3. Get out your ball popper toys. If you are not familiar with a toy called a ball popper, then this one is going to be a treat for you and your kids! Ball poppers come in a plethora of characters/animals to suit the child’s interests. (Note this toy has small parts, so it’s for children over the age of 3.) “Target practice” is a fun ball popper game I play with clients. Draw a target on a piece of paper and stick it up on any door. I use 2 points in the center, 5 for the middle, and 10 in the outside ring. Hand over the ball popper to your child to shoot the soft, foam balls at the target. Again, whatever number the ball hits closest to dictates how many times your child practices their speech sounds. I shared more PWP tips specifically for the ball popper toy on my blog back in September if you’d like to use the toy to address other skills. 4. Play the ‘Race to 100 Game’. This comes to us from fellow SLP blogger Felice of The Dabbling Speechie. She created a quick reproducible game board with 100 squares and used a die to get her students engaged AND practicing their speech sounds. The child rolls the die, and then they get to color or check off that number of spaces as they practice their speech sounds. School SLPs, like Felice, are often doing group therapy, so this can become a fun competition; whoever gets to 100 first is the winner. In my individual work, children can earn a small prize when they reach 100. 5. Get crafty. I like to use Dab and Dot Markers in a variety of paper-based activities. When working on a sound in isolation, I draw or print out a large, block letter outline. Then the child has to work on coloring in the letter one “dab” at a time by correctly producing their new speech sounds. Additionally, you can find printable coloring sheets online and in books for dot markers. And now the BONUS book review! 6. 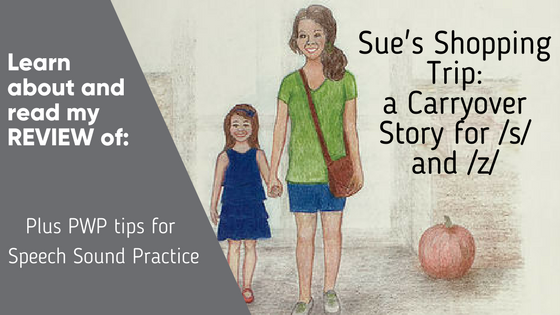 For my last PWP tip, I wanted to share a new book called “Sue’s Shopping Trip” created by fellow SLP Teresa Ahrens, MA, CCC-SLP that can be used to practice speech sounds. Helping children learn to generalize, or carryover, the skills from therapy into everyday life is always the last step in treatment and can sometimes be the most challenging. Teresa reflects on children’s unique need for support during this stage, “I created this material to help bridge the gap between spontaneous sentences and conversational speech when targeting /s/ and /z/ with young children. The story is repetitive, predictable, and contains rebus pictures so young children can tell the story after reading it a few times. 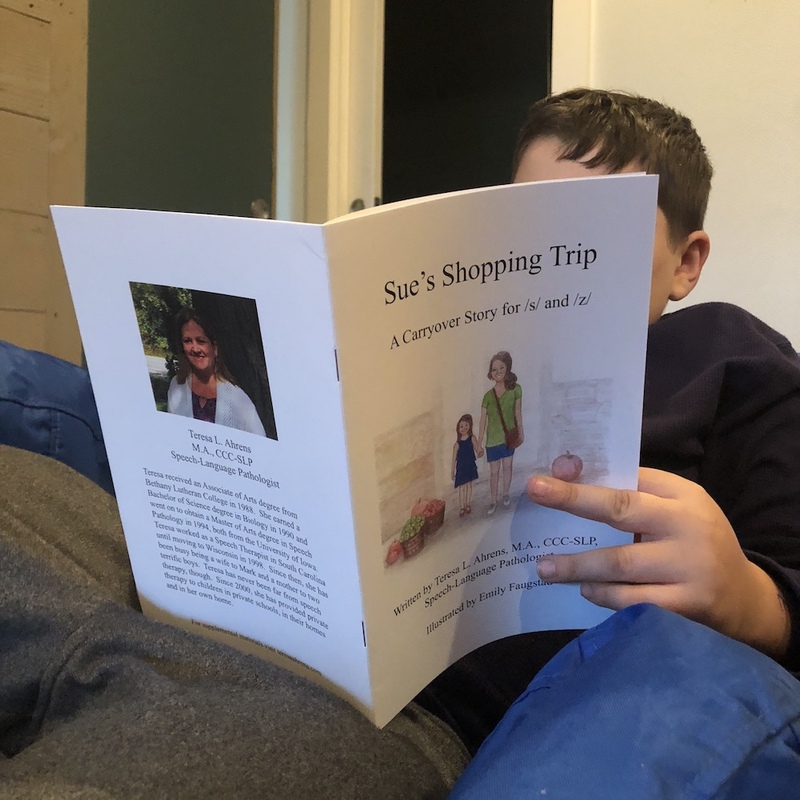 This enables the therapist [or parent] to elicit a longer speech sample from pre- and early readers that contain several opportunities to use the target sounds.” My Thoughts/Review Teresa’s 12-page book, “Sue’s Shopping Trip” is a nice addition to my therapy collection. It’s compact and affordable. I read the book with children aged 4-12 in my private therapy practice. This text is a great fit for pre- and early readers. The kids picked up on the vocabulary quickly, thanks to the rebus images (see photos), and they were engaged in the reading experience with me. If I counted correctly, the book provides 74 opportunities for /s/ and /z/ productions per reading! 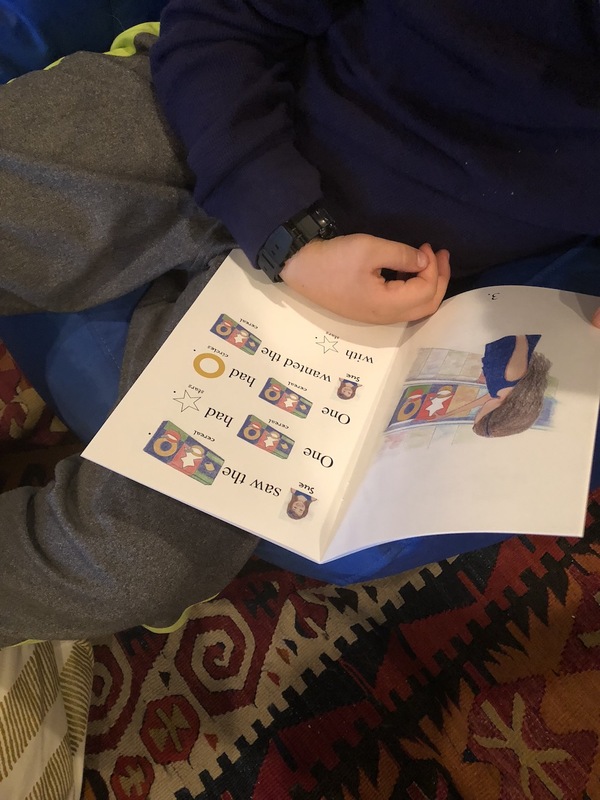 My older clients were less excited about the reading of the book due to the simple format however, we created an extension activity that they found much more fun. We took the basic layout of the story and the kids created extra pages for the book. They made sentences about the food they enjoyed such as, “Sue saw some string cheese and asked for a sample.” With the younger kids, we also used the target words to create/formulate our own sentences. For example, one child shared, “My favorite cereal is Lucky Charms because it has marshmallows.” When you purchase the book, you are given permission to copy the pages to send home with your clients. One addition I would like to see a list of the target words from the book that could also be sent home with kids. If it included the same images that were used for the rebus that would be an added bonus. I also found the layout of some of the pages to be a bit challenging to follow along. So a slightly larger book may be nice, so the words wrap from line to line with increased readability. There is application for other activities too, particularly for parents to use at home–comprehension questions and vocabulary expansion come to mind. Remember, improving speech sounds does not have to be mundane for you, your children, or your clients. No matter what repetitious activity you choose for sound production work, be sure you are Playing With Purpose!